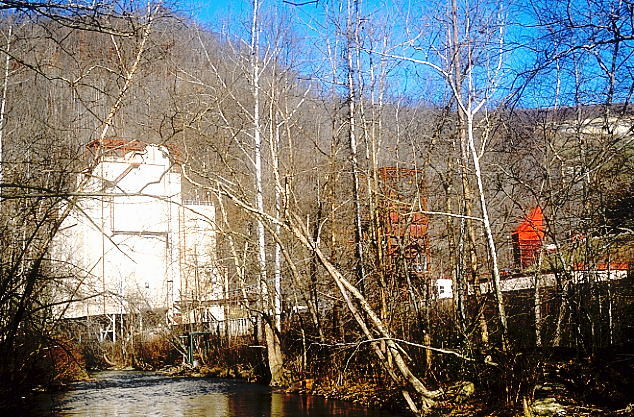 From Logan, I headed up Dingess Run and over Blair Mountain to the head of Coal River. 1. 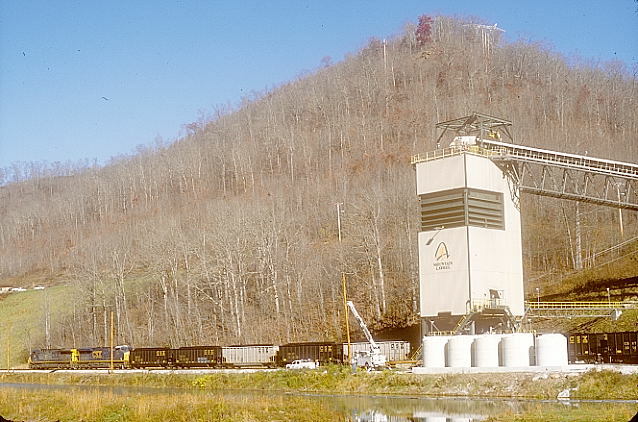 CSX 416-777starting to load a long unit train at Mingo-Logan Coal Company's Mountain Laurel Mine near Sharples. Sharples is actually in Logan County although in the Coal River District. 2. 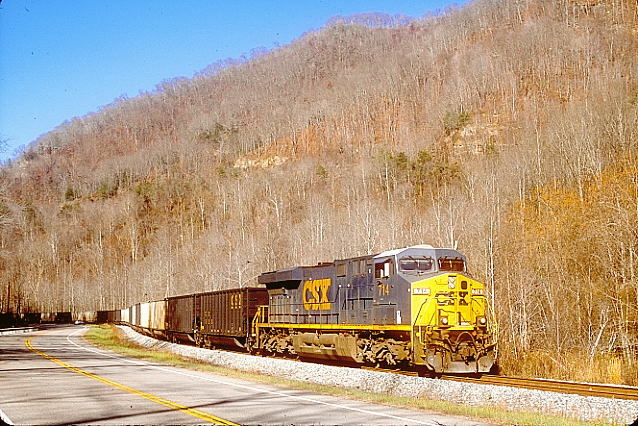 Going up Pond Fork of Coal River, I overtook CSX shifter H837-18 eastbound. 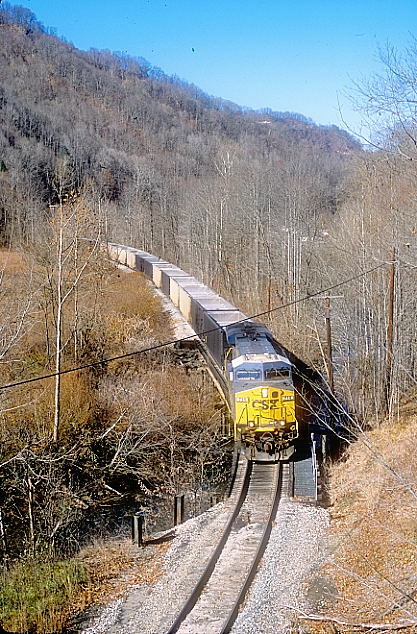 Here it is passing the east end of the Jupiter Mine siding (a spring switch) at Kohlsaat. 3. AC4400CWs 153-545 are trailing along. They will lead on the way back. 4. 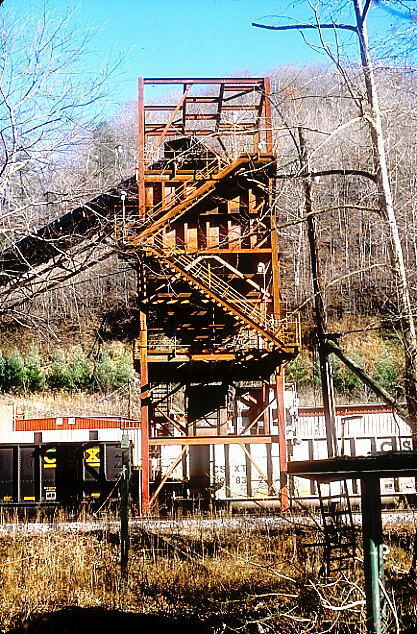 H837-18 nears the Rock Lick Mine. Shot from the WV 85 bridge. 5. H837-18 arrives at Rock Lick. One track has been removed. 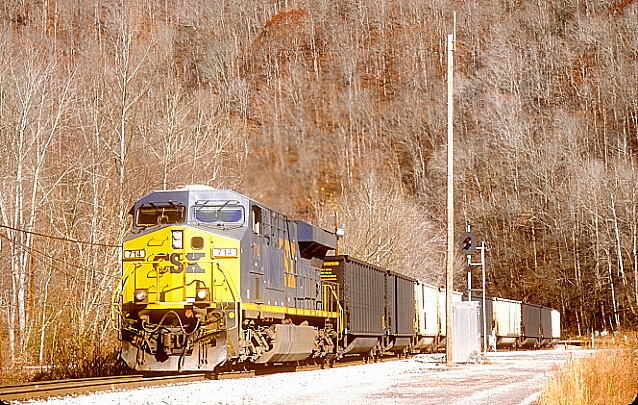 Eastern Associated/Peabody had a large GE center-cab switcher, but now CSX crews do the loading. 6. H837 pulls east along WV 85. 7. H837 will come to a halt in a few feet. Ahead the track on up to the inactive Harris Mine is weed-covered and out of service. 8. 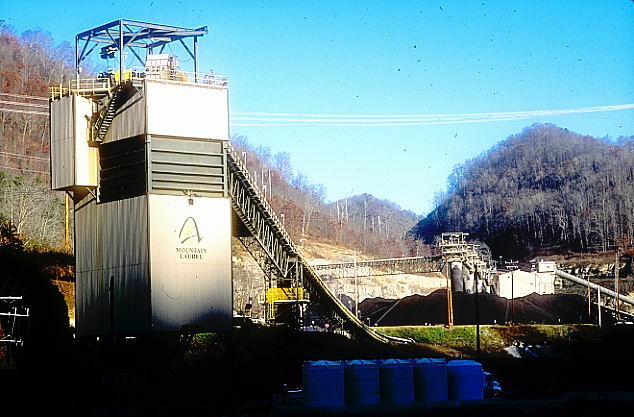 Patriot Coal's inactive Jupiter Mine at Kohlsaat, W.Va. Back in the '70s it was Island Creek Coal's Pond Fork Mine. 9. 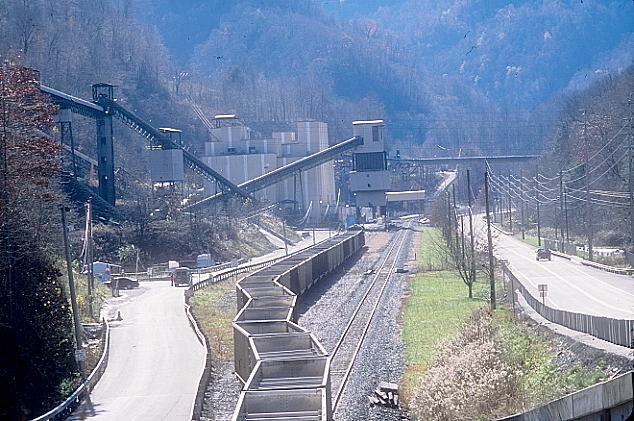 Jupiter had renovated the old Island Creek plant after being inactive for many years. 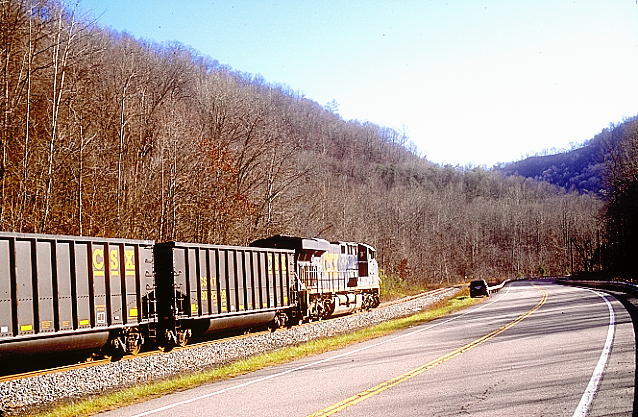 Jupiter had the capability to load a 130-car train in four hours. But don't be confused...those tubs are just stored on the long siding. 10. I decided to head back home via reverse route through Sharples. 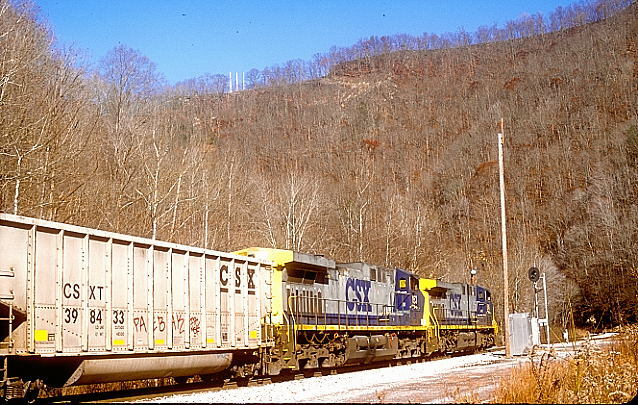 CSX 416-777 were still loading on the huige train at Mountain Laurel Mine. The shadows were covering the valleys and hollows, so I headed home.